You and your brother are peaceful farmers...or at least you were! 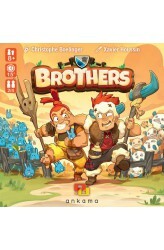 Now in Brothers, your herds are getting too big for the pasture. Outsmart your brother by placing your enclosures so he can't correctly place his and show him that you're the one with a head for cattle in the family. https://youtu.be/dJ60ThzPKRE .. Your goal in Draftosaurus is to have the dino park most likely to attract visitors. To do so, you have to draft dino meeples and place them in pens that have some placement restrictions. Each turn, one of the players roll a die and this adds a constraint to which pens any other player can add their dinosaur. 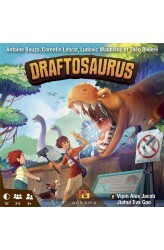 Draftosaurus is a quick and light drafting game in which you don't have a hand of cards that you pass around (after selecting one), but a bunch of dino meeples in the palm of your hand. https://www.youtube.com/watch?v=LI9QXhLpue4 ..
Every hundred years, the King organizes a race between the different clans living in the Kingdom of Ewala. The reward for the winners? The throne! The winner's clan will rule the country for a whole century! 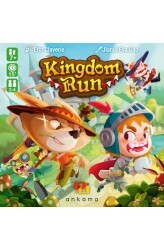 In Kingdom Run, four athletes from each clan are ready to use their legs and…your brain! Strangely enough, the faster you are, the faster your opponent can be. More specifically, each step forward that you take means two steps forward for them…unless the gap between you is too big. Who will be smart enough to become the next king of Ewala? In more detail, on their turn, a player rolls four dice that give actions they can do. (One reroll is possible for some of the dice.) You can chose to move your athletes forward, but you can also decide to move the ot..